Earlier on this month I was very kindly sent a copy of Dare to Fall by Estelle Maskame, author of the well loved DIMILY series, by Ink Road and Black & White Publishing (thanks guys!) 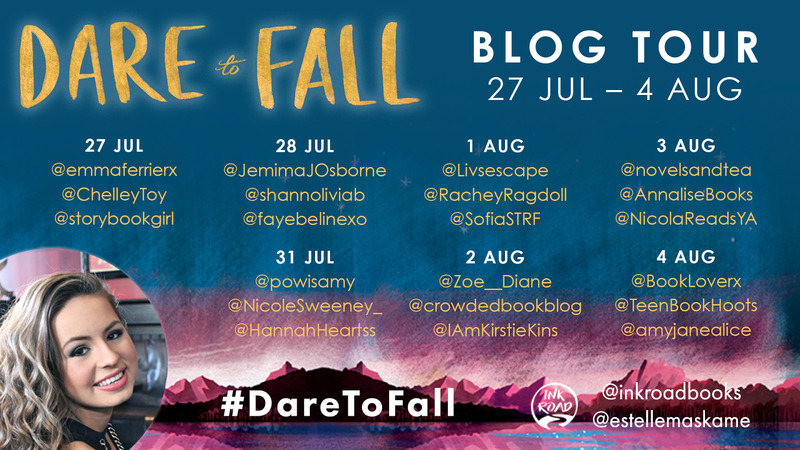 and today is my stop on the Dare to Fall Blog Tour. First of all, how beautiful is this cover? Despite not having read Maskame’s first series, I was super excited to delve into Dare to Fall after seeing so many positive reviews. She was afraid of it. He was used to it. There’s not much that MacKenzie Rivers is afraid of. In the small town of Windsor, Colorado, she is known for her easygoing, strong personality, some would even say she isn’t afraid of anything. But MacKenzie knows that’s not true. She’s afraid of losing those closest to her. Recovering from a family tragedy, Kenzie is fully aware of just how big an impact death can have on those it leaves behind. Seeing its effects on other people is something she just can’t quite handle. From now on, Kenzie is her own priority. There are not many things that Jaden Hunter can make sense of. He doesn’t understand why it was his parents who lost their lives last year. He doesn’t understand why his friends don’t crack jokes around him any more. He doesn’t understand why his teachers still insist on letting him skip assignments. He doesn’t understand why MacKenzie, the girl he was falling for last year, has suddenly distanced herself from him. Characters are super important for me when it comes to reading. If I don’t feel a connection with the character, I just don’t get on with the book. Luckily for me, Kenzie was totally relatable. She wasn’t the typical YA female protagonist who is exceptional at everything and the most beautiful girl in the school, and this made me warm to her pretty quickly. I really enjoyed the dynamic in her friendship group (well, up to a certain point but you’ll have to read the book to find out more about that!) as it was something different to what you would usually find in a YA contemporary as they are both male, and the way she approached one of the characters who was feeling lonely and shut out made me like her a whole lot more. However I must admit that sometimes Kenzie did feel a little 2D compared to Jaden. So Jaden… lovely, lovely Jaden. The way he handled the awful situation that was thrust upon him was inspirational and empowering. His attitude was refreshing and helped to give me a clear perspective on a few situations of my own. And his relationship with Kenzie? Serious book boyfriend material. There were plenty of times where I literally said “aww” and almost had butterflies myself! Maskame’s writing had me gripped – I read the book in just two sittings. I HAD to know what was going to to happen, especially throughout the last few chapters. There was a sort of *twist* towards the end, and while I suspected that was something a little off about the character it relates to, I never anticipated the ending – I can usually guess so that made a nice change! Fluffiness aside, Dare To Fall deals with sensitive subjects such as grief, loss and alcoholism, but Maskame handles them with such care which is very admirable; to call it an emotional read would be understatement. While the ending was hard-hitting, I finished the book with a full heart and felt content. The story has a very profound message weaved through it and definitely gave me a lot to think about long after I’d put the book down. A bittersweet contemporary that deals with love, loss and everything in between, Dare to Fall was a fast paced read that filled my heart with hope and happiness, but definitely did it’s fair share of heart breaking too. You can get you hands on Dare to Fall here, I highly recommend. Don’t forget to check out the rest of the blog tour posts below!